This interview with Miyamoto was recently released at The Guardian, and while Nathan posted about the mention of A Link to the Past 3D, the full interview talks about Ocarina of Time 3D, Miyamoto’s plans for the future, as well as some of his inspirations. Check out the full interview below. From a design perspective, [the late Game Boy creator] Gunpei Yokoi. Are there any games you’ve played over the years that you wish you’d made? Sim City on the PC. Given your experience, have you considered writing a book about games design or teaching others? When I leave the company, I would like to work with young people and teach them about developing. Though it wouldn’t be like [traditional] teaching, more explaining how we think and how we interact with the user. For the development process, practical learning is important. 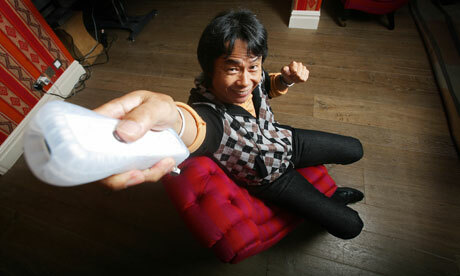 If you could work at Nintendo with anyone else from the games industry, who would it be? I would prefer to grow with the team inside Nintendo rather than taking anyone from outside. It would be a joy for me if someone who was working with me became a big success. You’ve just remade The Legend of Zelda: Ocarina of Time for 3DS (out in June). Why choose that game for a 3D update? We thought the world of Hyrule would be more immersive for the players to experience in 3D and also the horse riding and the thrill of exploring would be heightened. What changes have been made in the new version? The touch screen allows users to place items where they want and also to display the map. It uses the 3DS gyro sensor to fire Link’s bow and arrow and his slingshot, too. This can be difficult with a controller, but more intuitive moving the 3DS around to aim. Are there any plans to adapt other older Nintendo games for the 3DS console? Not really. We would like to create more new titles. For example, this year we are making Super Mario 3D, but it’s not really a remake of [the Wii’s Super Mario] Galaxy. The Legend of Zelda: Link to the Past could be one of them. I think it would be good to see that world with a layered 3D effect. There are a lot of rumours surrounding Nintendo’s next home console. Is the company’s biggest challenge at the moment to come up with something completely different from its competitors? Is it getting more difficult these days for Nintendo to satisfy gamers’ needs and to find the right balance between the quality and timeliness of releases? I think that’s true, even more so because there are more pieces of hardware and we need to create games that are suited to the hardware. As for delivering a game, sometimes we have to give up on an idea, but it’s my feeling that you should always try to provide the best possible experience to the users! Do you see your role at Nintendo changing in the future? Well, I’m not really thinking of retirement yet! Maybe in the future, I will focus on fewer titles. When you do leave Nintendo, what do you hope your legacy will be? I’d like to be known as the person who saw things from a different point of view to others.